One year on from the controversial eviction of Occupy Melbourne from the City Square, the Occupy Melbourne Legal Support Team has authored and released a qualitative report, entitled Occupy Policing: A Report into the Effects and Legality of the Eviction of Occupy Melbourne from City Square on 21 October 2011. The Report documents protesters’ experiences of policing. The Report complements these eye-witness accounts with an account of the relevant laws. Recently I read an article on Indymedia that was a review on a DIY bridge gig held in North Melbourne. I have decided to write this follow-up article looking at a few of the DIY gigs that have been happening around Melbourne at the moment. Especially in the punk scene lot of the DIY of movement has been growing somewhat stale compared to what it has been in previous days. Longshore Workers, Truckers: Shut the Ports, Coast to Coast! 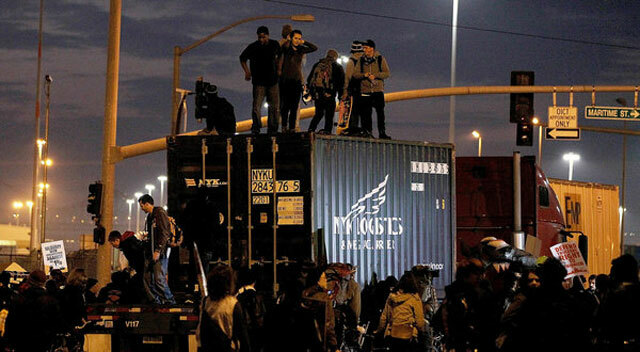 Read more about Longshore Workers, Truckers: Shut the Ports, Coast to Coast! Almost 35 years since punk hit independent bands in Melbourne, Australia are still keeping the punk spirit alive. They are are saying F*@% you! to the main stream venues around that charge high prices for drinks, large entrance fees and make bands jump through hoops to play by running their own shows in unused spaces. After our weekend picnics were rained out on consecutive weekends Occupy Melbourne's Dare To Share Teddy Bears Protest went off on Friday December 9th without a hitch. About 25 kids, carers and others met up in Treasury Gardens at 10am for a picnic before heading off on a tour of the various bodies involved in cutting $481 million from education spending in the past year. Despite a little interference from Protective Services officers we were able to occupy the lobbies of the Premiers Office, Department of Education and Department of Education (Office of Children and Early Childhood) buildings. At each we engaged in various activities including mic checks linking the big picture (capitalist greed) to the everyday one (cuts to TAFE, VCAL, occasional care, school maintenances, etc), sining the Teddy Bears protest song (lyrics below) and presenting novelty sized Education report cards (small version attached) failing the government for its anti-social behaviour and indicating that it "must do better". A fun time was had by all and we have plans for more kid friendly protests in the near future. The explosion of rage we see all over the world doesn’t start from joyfully indignant citizens, respectful of the constitutional State, who can afford the luxury of non-violence… but from us, exploited proletarians, in struggle against the every time worse conditions of survival imposed on us. Here is the lowdown on pepper/capsicum spray for those who couldn't get to our direct action workshop. i handed out photocopies based on starhawk's action medics manual here: http://www.starhawk.org/activism/trainer-resources/teargas.html but i just want to say that while the information is excellent, the language is a liiiiiiiiiiiiittle bit hysterical, so here is my opening spiel, followed by a condensed version of how to deal. THIS IS NOT A DEFINITIVE GUIDE. see video 5 - 1min 47 seconds. Over 1000 people marched from the State Library of Victoria to Treasury Gardens on 29th October 2011 as part of the ongoing Occupy Melbourne protests. Our boys and girls in blue were on the streets again today, dodging criticism for the use of brutal strong arm tactics against the public when evicting the Occupy Melbourne protest from City Square on the 21st of October.